RSVP for Convocation by May 6, 2019 at 5pm. If you RSVP after May 6, Sheridan cannot guarantee the availability of guest tickets. Convocation celebrations for student's graduating from a Sheridan program following the Fall and Winter 2019 semesters will be held at the Living Arts Centre in Mississauga, ON. Information on Convocation 2019 will be posted in Spring 2019. Every guest must have a printed ticket to be admitted to the ceremony. Graduates do not require tickets to attend. Electronic versions will not be accepted. If you no longer plan to attend your convocation or you no longer require guest tickets, kindly return to the RSVP form (details above) and update your information so that we may reassign your allotted tickets to others. You can register* for your convocation ceremony and order your guest tickets and gown through the Convocation Ceremony RSVP form. You will only be able to access the RSVP form if you are a recent graduate or are eligible to graduate in the Fall 2018 or Winter 2019 term and have successfully applied to graduate. Graduating students are allocated up to two (2) guest tickets each. Graduates do not require a ticket for themselves. For most ceremonies where expected attendance is high, no additional guest tickets are available. This will be indicated by a ‘0’ on the RSVP form for additional tickets. For the ceremonies where additional tickets are available, graduates may request one additional ticket using the RSVP form; the additional ticket will be confirmed one week before the ceremony. If additional guest tickets become available for your ceremony, Sheridan will email you during the week of May 6, 2019. ** If you are requesting additional guest tickets and the only option available on the RSVP form is '"0", no additional tickets are available for your ceremony. In the Graduation section near the bottom of the page, follow the link Convocation Ceremony RSVP (remember, this link will only be visible after you have successfully applied to graduate). 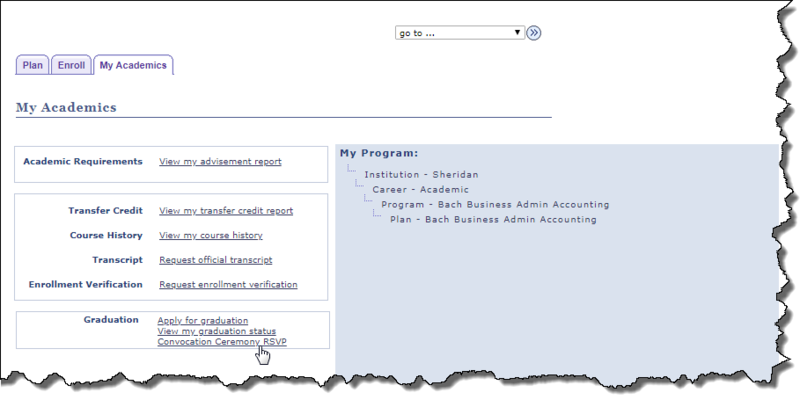 When you are done click the button SAVE CONVOCATION INFORMATION and close the window. * The request form will open in a pop-up window. Be sure to disable any pop-up blocker you may have employed or take steps to allow your browser to display the page. If additional guest tickets become available for your ceremony, Sheridan will email you during the week of May 6, 2019. Guest tickets will be assigned by the beginning of June. You will receive an email providing information about seat assignments and any further details you might need. If you change your mind about attending Convocation after you have already registered for your ceremony, go back into the Convocation Ceremony RSVP form and change your choice to 'Not Attend'. Your certificate/diploma/degree will be mailed to you after Convocation is complete (if it hasn't already been received by you). Gown size is determined by your height in feet and inches. A sizing chart can be accessed on the Request Form to assist you in picking the correct size. Your gown will be available for pick-up on the day of your ceremony at the Living Arts Centre. Robes and/or hoods must be returned at the end of the ceremony. Items removed from the Living Arts Centre will be charged to the graduate. Your name will appear on your certificate/diploma/degree as FIRST MIDDLE LAST. If this is not correct and you require a change please visit the Office of the Registrar and present official documentation supporting your name change. Also, make sure your email address and telephone number are up to date in case Sheridan needs to contact you. Find the date and time of the convocation ceremony for your program. Please note that convocation for each faculty may be split across a number of sessions, so make sure you identify the correct session for your program. Remember, in order to be awarded your credential and attend Convocation, you must first Apply to Graduate. Ceremony 1: Monday, June 10, 2019 3:00 p.m.
Ceremony 2: Monday, June 10, 2019 7:30 p.m.
Ceremony 3: Tuesday, June 11, 2019 10:00 a.m.
Ceremony 4: Tuesday, June 11, 2019 3:00 p.m.
Ceremony 5: Tuesday, June 11, 2019 7:30 p.m.
Ceremony 6: Wednesday, June 12, 2019 10:00 a.m.
Ceremony 7: Wednesday, June 12, 2019 3:00 p.m.
Ceremony 8: Wednesday, June 12, 2019 7:30 p.m.
Ceremony 9: Thursday, June 13, 2019 10:00 a.m.
Ceremony A: Thursday, June 13, 2019 3:00 p.m.
Ceremony B: Thursday, June 13, 2019 7:30 p.m.
Click to the headings below to view the graduation ceremony agenda for each group. The Readers, Faculty and Deans & Executive agendas will be published shortly. Please check back. Convocation ceremonies will take place at the Living Arts Centre, 4141 Living Arts Drive, Mississauga. All convocation ceremonies will be held at The Living Arts Centre, 4141 Living Arts Drive, north of City Centre Drive in Mississauga, Ontario. Refer to the schedule to determine the convocation date and time for your program. Arrive at the Living Arts Centre at least one hour prior to your scheduled ceremony for Graduand Check-In - the processional begins 15 minutes prior to the start of the ceremony. Be sure to give the guest tickets to your guests. Proceed immediately to the Robing Room when you arrive. Guests must be seated 20 minutes prior to the ceremony start time. Guests arriving after this time will be seated in an appropriate break in the ceremony. Light refreshments will be served immediately following the ceremony. Please return your robe and hoods following the ceremony. Robes and/or hoods removed from the Living Arts Centre will be charged to the graduate. Congratulatory floral bouquets from Professional photography services will be available for you during convocation. Lifetouch Canada Inc will be on site to capture you crossing the stage during the convocation ceremonies. Should you wish to receive proofs after your ceremony, you MUST check the consent box while completing the online Convocation Ceremony RSVP form. If you have consented, Lifetouch Canada Inc will email graduates directly with details on how to view your proofs, following convocation. A Sheridan Information booth will be located in the lobby of the Living Arts Centre for any additional information you may need. Overnight accommodations are available at the Sheridan Residence in Brampton or Oakville for $64.95/suite. For reservations, please call our toll-free number 1-877-225-8664 and ask to be transferred to your preferred location. When making your reservation, please ask for the Sheridan Convocation rate.